Sunbury on Thames, UK – April 1, 2019 – Kingston Digital Europe Co LLP, the Flash memory affiliate of Kingston Technology Company, Inc., a world leader in memory products and technology solutions, today introduced its new High Endurance microSD card. The card is especially designed for write-intensive application use such as home security and surveillance cameras, dash cams and body cams. As write-intensive applications critically depend on a high level of reliability and performance, Kingston’s High Endurance microSD card provides durability, high-storage capacity and prolonged endurance to meet the unique recording demands of home security cameras and dash cams. The High Endurance microSD card stores up to 20,000 hours1 of seamless video recording in full 1080p HD to capture a reliable record of what happens whether at home or on the road. 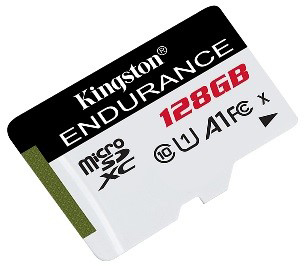 Kingston’s High Endurance microSD cards are available in 32GB, 64GB and 128GB capacities and are backed by a two-year warranty, free technical support and legendary Kingston reliability. For more information visit www.kingston.com. 1 Based on internal testing data with 128GB capacity. Hours may vary based on host device and usage. 2 IEC/EN 60529 IPX7 certified for protection against continual water submersion up to 30 minutes and depth up to 1m. Withstands temperature range from -25°C to 85°C. Based on MIL-STD-883H, METHOD 2002.5 military standard test method. Protected against X-ray exposure based on ISO7816-1 guidelines. 3 Some of the listed capacity on a Flash storage device is used for formatting and other functions and thus is not available for data storage. As such, the actual available capacity for data storage is less than what is listed on the products. For more information, go to Kingston’s Flash memory guide at kingston.com/flashguide. Kingston Digital Europe Co LLP is an affiliate of Kingston Technology Company, Inc. the world’s largest independent manufacturer of memory products. Kingston designs, manufactures and distributes memory products for desktops, laptops, servers, printers, and Flash memory products for computers, digital cameras and mobile devices. Through its global network of subsidiaries and affiliates, Kingston has manufacturing facilities in California, Taiwan, China and sales representatives in the United States, Canada, Europe, Russia, Turkey, Ukraine, Australia, India, Taiwan, China, and Latin America. For more information, please call +44 (0)1932 738888 or visit www.kingston.com. Editor’s Note: For additional information, evaluation units or executive interviews information please contact Debbie Fowler, Kingston Digital, Inc. Kingston Court, Brooklands Close, Sunbury-on-Thames, TW16 7EP. Press images can be found in Kingston’s press room here.